First Nations people along the Lewis and Clark Trail played two types of traditional games: Guessing games of chance that were played sitting down inside, and physical contests that included running, throwing, and catching outside. Native cultures along the Lewis and Clark Trail and throughout the continent believed that guessing games and physical contests were not simply games of chance and skill, they were competitions to measure a person’s overall ability, including their intuitive skill and spiritual power. What types of traditional games did First Nations communities along the Lewis and Clark Trail play throughout the year? How were traditional games played and what types of skills were required to master them? How did traditional games build skills for a successful life? The Northern Plains are an area of great movement, where all the tribes moved in a seasonal cycle, trading and interacting with one another throughout the year. The people traded and competed at these games, and therefore they were widespread and shared by many tribes. Playing games, like playing music or participating in a ceremony, provides an opportunity for individuals, teams, and communities to be healed and strengthened. Overcoming physical, mental, emotional, social, and spiritual limitations is one of the goals of tribal competitions, therefore the games themselves are a multi-faceted exercise in holistic health. Students will learn and play at least one of the Native games outlined in the lesson. Students will write about the skills that are needed to succeed in the games. What can we learn from playing traditional Native games? What could Lewis and Clark have learned from playing Native games? Students engage in a classroom K/W/H/L discussion to decide as a group what they know, what they want to learn, how they will learn it, and finally what they will discover in their research process. Students play the games and display a good-natured spirit of competition. Respecting yourself, your opponent, and the game itself are important values in Native games along the Lewis and Clark Trail. Double-ball materials: Double ball and 8 to 10 sticks for players. Students will have a discussion following the game to talk about the skills and talents required to be a good double-ball player. Students will understand: How probabilities are calculated; the definition of “intuition”; and the importance Native peoples place on the skill of intuition. Do you think intuition is an important skill to be developed or is choosing correctly in life more of a game of chance? Do you think your intuition played a role in doing well in this game? Why or why not? How might we use intuition in our own personal daily lives? Play the Stick Game with respect and fun. Consider the value Native peoples place on the skill of intuition. Consider the role intuition may play in their personal lives and choices. Successfully play multiple and varied rounds of the Blackfeet Stick Game. Engage in a thoughtful discussion of intuition and its role in life. 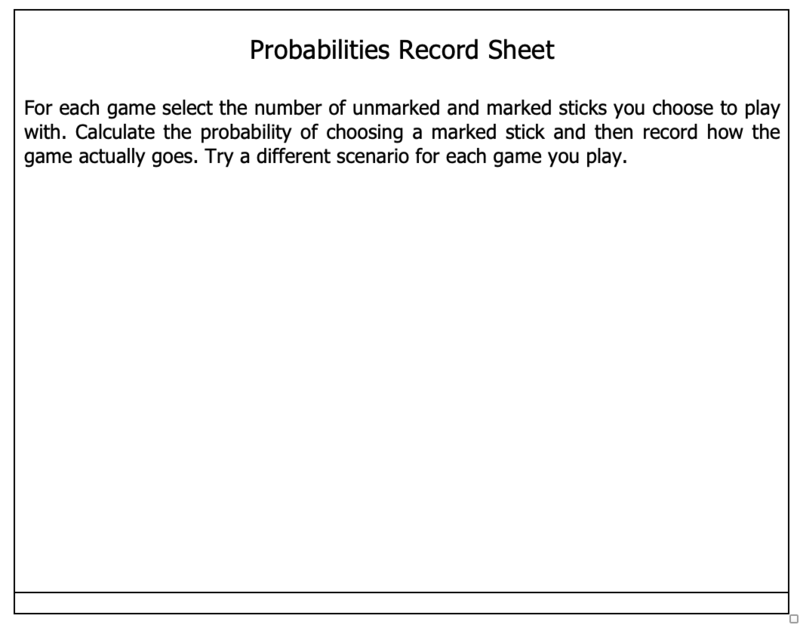 Students will begin to calculate probabilities in other scenarios in life. Students will play this game at home or on the playground with new groups of players. In all traditional games, it is understood that the use of medicine is a natural element of the competition. Medicine is the word used to translate the First Nations term for spiritual power, which can manifest itself in any game, event, or crisis. Tribal communities throughout the Lewis and Clark Trail have a common worldview that all people share this elemental force, something like “spiritual capital”, that can be utilized to influence processes and outcomes. The popular traditional game known as Stick Game, Hand Game, or Bone Game is played by over 80 tribes across the continent, but it is most popular in the northwest along the Lewis and Clark Trail. The game has been played for thousands of years and is still extremely popular and played frequently. Most tribal communities along the Lewis and Clark Trail continue to host annual Stick Game tournaments where tens of thousands of dollars are wagered and won by both championship teams and fortunate gamblers. Watching the video of the Stick Game in Arlee will provide students with a visual and audio lesson in how the game is played. Students can gather their own materials for the game in a humble way and also learn the songs to sing while playing the game. If materials for the Stick Game are not present, students can gather them by using popsicle sticks or wooden dowels, or by going outside to collect sticks of similar length and rocks for hiding. Students will break into small groups of three to four and read the Lewis and Clark journal entries that mention the Stick Game. Each group will start its own K/W/H/L chart on traditional games. The whole class reconvenes after 10-15 minutes to share what they have written and added to a larger classroom K/W/H/L chart. The entire class watches the Stick Game video. Students go back to their small groups. The groups are now Stick Game teams and will play each other for 30 minutes in class, mainly focusing on learning to play the game. After students have played the game, introduce a discussion about the concept of intuition. What is intuition? Do you think intuition is an important skill to be developed or is choosing correctly in life more of a game of chance? Do you think your intuition played a role in doing well in this game? Why or why not? How might we use intuition in our own personal daily lives? Eleven popsicle sticks, wooden dowels, or twigs/branches, and also a small rock to hide in the hand. Drums and drumsticks are optional. If you choose to watch the Hand Game video, advanced students could also calculate the probabilities involved in these games. 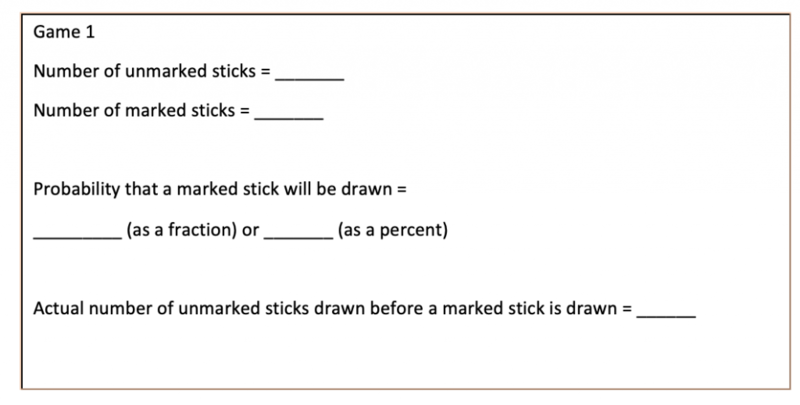 Students struggling with the concept of probability may benefit by beginning with a small number of sticks and working up as the concept begins to solidify.